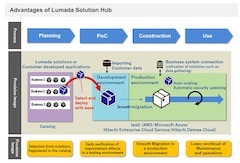 TOKYO, Mar, 20 2019 - (JCN Newswire) - Hitachi, Ltd. (TSE: 6501) will sequentially release Lumada Solution Hub from April 1, 2019, to advance and facilitate customers' digital transformation and help them innovate. 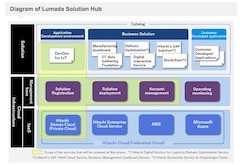 Lumada Solution Hub registers Lumada solutions and application development environments, which have incorporated technologies and industrial expertise validated through collaborative creation with customers, into catalogs(1) as an easy-to-introduce package, and provides them on a cloud infrastructure. With this, simply by choosing Lumada solutions and applications to be introduced from the catalog, customers can instantly build an environment on IaaS(2) and quickly begin using them. It allows smooth migration for customers from the early verification of Lumada solutions to a production environment, and efficient deployment to multiple bases including overseas. Recently, as the velocity and complexity of changes in the market increase, companies across many industries require digital transformation that properly and quickly implements new service creation and business reform utilizing digital technologies such as AI and IoT. In order to continue these activities, a variety of expertise and know-how are required throughout areas such as environment construction utilizing software and hardware, development and PoC of applications, migration to a production environment, expansion to multiple bases, and operations and maintenance. The enormous cost and time demands are the issue that affects customers. 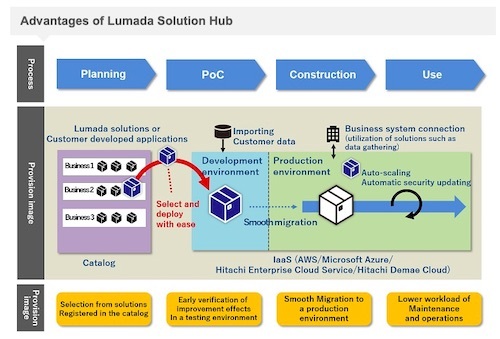 Lumada Solution Hub will resolve these issues with Lumada solutions through early verification, smooth migration to a production environment, more efficient application development, and lower workload of maintenance and operations to assist with customers' digital transformation. The following describes the four major capabilities. Employment of OSS such as Docker, which provides a container-type virtualization environment, and Kubernetes(4), which remotely deploys, configures, and manages containers, allows for packaging to reusable form and stocking Lumada solutions, as well as centralized management and rapid deployment to IaaS. This enables customers to build an environment on IaaS that is suitable for a specific purpose simply by choosing solutions to introduce, for stating the quick verification of Lumada solutions. 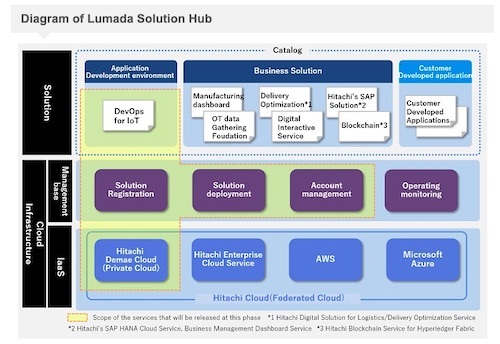 Hitachi plans to register business solutions in Lumada Solution Hub in the future, such as a service to create highly effective delivery plans utilizing AI and IoT and a service to help introduce blockchain, which are scheduled to be released from the first half of FY2019. Hitachi will support multi-cloud environments. As the first step, Hitachi will release the version of Hitachi Demae (delivery) Cloud(5) that provides a private cloud environment. 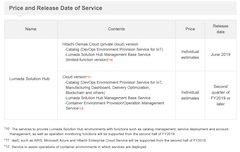 From the second quarter of FY2019(6), Hitachi will support IaaS such as AWS(7), Microsoft Azure and Hitachi Enterprise Cloud Service. This helps customers reduce system construction work at the customer site and quickly deploy Lumada solutions to multiple bases including overseas. Hitachi will release DevOps Environment Provision Service for IoT to build application development environments. This service assists the rapid startup of a DevOps(8) scheme by integrating the development team and operations team with tools such as Redmine, a project management tool suitable for agile development*9. By utilizing tools such as Node-RED, a GUI programming tool, even workers who are unfamiliar with IT can easily develop applications. Furthermore, by packaging developed applications and stocking them in the cloud infrastructure, it simplifies the combination and customization to meet customer needs, enabling quicker and more efficient development than development from scratch. Hitachi will advance collaborative creation activities with customers as an innovation partner in the IoT era, and continuously stock and enhance developed applications, to evolve Lumada Solution Hub and contribute to create new value for customers' businesses and society as a whole. (1) Catalogs are packaged solutions visualized in the list. (5) As of April 1, 2019, the release date of the solution, it will support Hitachi Demae Cloud, which is provided as a ready-to-use private cloud environment that accommodates servers, storage, network appliances and the management console required to build a cloud infrastructure all on one rack. (8) Combination of development and operations, and the method and idea to develop new functions and improvements required from the operation side, by working closely with the development team and operations team. 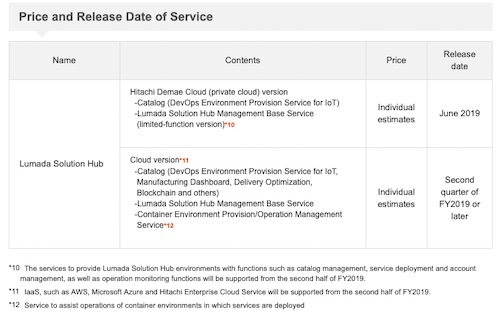 (10) The services to provide Lumada Solution Hub environments with functions such as catalog management, service deployment and account management, as well as operation monitoring functions will be supported from the second half of FY2019. (11) IaaS, such as AWS, Microsoft Azure and Hitachi Enterprise Cloud Service will be supported from the second half of FY2019.